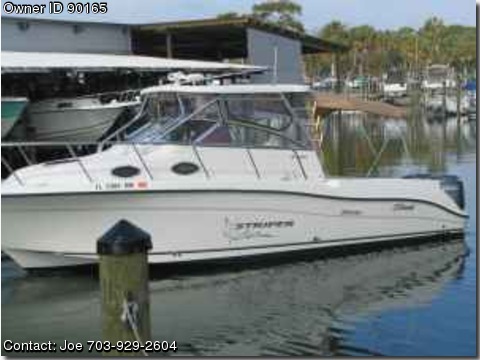 For sale is my 2004 SeaSwirl Striper 2901. The Striper 2901 Walkaround starts with the Fibercore™ one-piece stringer system and state-of-the-art V-Trac™ hull, giving you optimal performance and durability. The industry’s best-selling 29-foot, wide-beamed fish boat. It offers you a large cockpit, wide walkway and spacious cabin with 6' 5" of headroom. A stylish cabin with all the spoils completes the picture-perfect boat. She is equipped with a 5500w generator, AC & Heat, Microwave, Fridge, full head, shower, sink and TV for the extended stays. The overall length is 29'10" and has a beam of 10'6". She is powered by twin Yamaha 4 Stroke 225's which have only 500 hours on them. At the helm Navigation is easy with a Furuno 10" display which controls your gps, chartplotter, 1000watt transducer, and 6kw radar. There is also a TR1 Autopilot which makes fishing or cruising a breeze by yourself. On the hard top is a remote control spot light, 15'Tapco outriggers, and VHF antenna. Boat is also equipped with a windlass anchor mounted on the pulpit. In the cockpit are 2 fish boxes mounted in the floor, a 30 gallon live-well, and a walk though door in the transom. I also have a 2007 Raptor 3612 fifth wheel which is located 3 miles away from the marina for sale, could make someone a great weekend getaway package. Call Joe at 703 929-2604.